The Gnu Hyperkyarve, to us, is a combo of the TRS and the former Space Out. It gives you grip and the XC2-BTX camber profile of the TRS with the directional surfy shape of the Space Out. It’s a very forgiving ride that has a mountain freestyle feel with a surfy directional freeride shape. Little has changed from the 2017- 2019 Gnu Hyperkyarve models so the old review still stands. Conditions: Everything from good Sierra Powder and messy groomers to hard PNW snowment with some powdered sugar in places at Mt. Bachelor. Sizing: The 154 and 157 are mainly for size 10 and under boots but the 160 could probably handle up to a size 11 boot. Especially one with reduced toe/heel drag….aka a reduced footprint boot. Flex: So it’s got an easy flex on snow that’s easy to butter and play around with. It doesn’t feel like the flex you would think it is in the shop. All of us could easily butter this board but it’s also stiff enough to easily ride the mountain. On Snow Feel: Not catchy at all and very forgiving. It’s got a mountain freestyle personality in a freeride shape. It’s got that same loose feel underfoot in harder snow when one footing off a chair or flat basing as most hybrid rocker boards and it likes to be on edge. Some can get used to this and others prefer the stability of hybrid camber over this hybrid rocker profile. The one thing is the XC2-BTX camber profile didn’t feel as camber heavy as the TRS’s we tried. We thought it was C2 or EC2 at first instead of XC2. That being said the bends in all hybrid rocker profiles from all companies vary so we could have got one with more rocker and less camber than you might. Edge Hold: Right up there with top boards and MTX and although mellowed out a bit over the years It still grips incredibly grippy. It doesn’t grab too much in softer powder like the old MTX use to but some might still not like the feel in powder or soft snow. Turn Initiation: Really quick and easy edge to edge. The rather pronounced rocker makes it turn faster than you would think. Turning Experience: Super fun to turn and it’s pretty fun making all kinds of turns. The rocker in the middle seems to hurry you through a turn more but it’s still pretty rewarding. Skidded Turns: Super easy to skid turns and very forgiving for a freeride board of this shape. Carving: So despite the weird spelling of carve (kyarve) it’s not an amazing carver but it’s competent for sure. It’s better in hard snow but not a dream carver like C3 boards or boards with more camber. You have to put a little pressure on the tail to really make it happen and it can get a little washy off the tail in harder snow. This would be amazing if it had C3 with a good bit of early rise rocker in the nose but then you would lose a lot of the board’s playfulness that gives’s it such a unique freeride/freestyle personality. Speed: It’s not the kind of speed board that you would think you would find in the freeride category but it makes up for it by being pretty forgiving. It bombs ok but that loose feeling between the feet isn’t ideal for those that really like to point it. Uneven Terrain: Very easy weaving in and out through bumps. Powering over small but consistently uneven bumps isn’t perfect but very doable. I had no problem keeping a line through moguls and liked doing it. Powder: Very good float with the setback and nose that sits above the snow due to the rocker in the middle and camber that doesn’t come all the way back down. With approximately a 22.6″ stance width you can set this 5.5″ back on board which is really good for an all mountain board and just about par for the course for freeride boards. That’s enough to handle the deep deep you can get once or twice on an average season with resorts out west. Switch: Better than we thought it would be. It’s not as good as the TRS but it’s pretty fun for how set back and directional it would be. With a 1.5″ set back on sidecut as well as a longer nose you can’t get it truly centered on board but you can center it (or get very close to centering it) on side cut by moving it up 2 inserts. I think that’s what makes it ok switch when we tried to center it. Jibbing: Doable but far from ideal. Pipe: The edge hold, quick turn initiation, and pretty good carving ability make us think it would be good in the pipe but no pipe was built at the time of this review. With all the snow it’s been slow going at Mammoth. Jumps: Nice pop and great directional air. It’s also ok to land switch so you can spin with this. So, all in all, it’s not a traditional freeride board but it’s fun and I think it could appeal to a wider variety of riders than you would think. It could appeal to riders of all levels that like a mountain freestyle/freeride combo as well as those that are just getting started and think they want to work their way towards mostly directional mountain riding but don’t want to get bored when they get better. We try to get as many images of the Gnu Hyperkyarve, but forgive us if they're not all there. 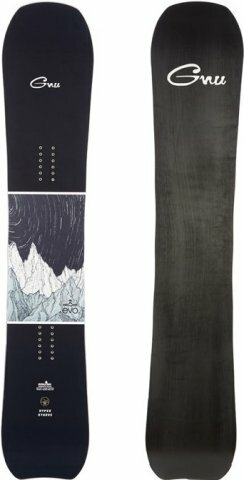 I bought this board to ride on powder days and it has performed. I mostly ride on the weekends, so I wanted something that could handle the kind of deep, thick, tracked out powder we get by mid-day at WA resorts, and the Hyperkyarve has been perfect. It turns through the trees super quick, is super stable catching air and landing in soft snow and it keeps it's grip when I find an ice patch. This is such a great board for hunting through ugly terrain to find those last few patches of powder in the trees. A big thanks to TheGoodRide for the reviews. I agree that for carving and for speed on groomers this board could be better. It just doesn't feel all that stable on harder snow.